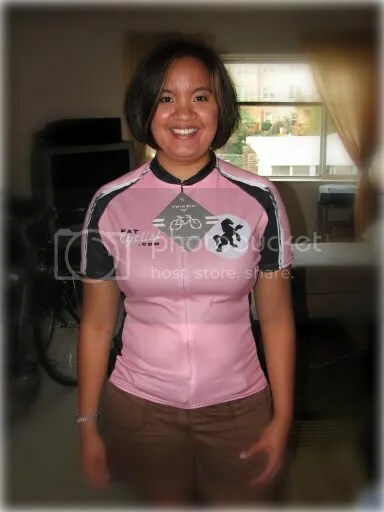 I ordered my FatCyclist jerseys (one for me and one for my husband) as soon as they went on sale and a week later they arrived in my mail box. I must say that I LOVE that woman’s fit. It doesn’t squeeze me in all the unflattering places (tummy) some other jerseys do. I still have the tag on so that diamond thingy on the front is not there. It is a beautiful jersey, pink to boot, and goes to an AWESOME cause! To Elden and Susan, WIN! So I did go to the Performance Bike yesterday to return my Speedplay Frog pedals. I decided to just stick with what I have (the yellow Crank Brothers Candy C) as they didn’t at all bother me on the very flat century I completed last weekend. I know I need to get a ride report in. I didn’t buy the rain jacket that I was thinking about getting last post but I did walk out with a new, cheap saddle and a pair of Pearl Izumi Sugar knickers. I have been having saddle comfort issues and wanted to see if I could alleviate this some. I hate being cheap when it comes to buying things but I am learning that you get what you pay for. Anyway, I installed the Forte Women’s Contour Saddle. I really liked that it had the cut out and was a bit wider than my current saddle and it was flat. I wanted to just test that out with my old shorts but I realized I hadn’t done laundry in a few days and was out of bike bottoms. So I had to wear my new knickers today with the saddle. Seriously, the most comfortable ride saddle-wise thus far ever this morning. I am definitely keeping the knickers as they rock but I will have to see if the saddle also makes a difference. As to the rest of Bike to Work Day, aside from the pitstop it was fairly uneventful. I hit some rain a few minutes from my pitstop at the Whole Foods in Vienna but it stopped while I was there. I seem to remember that last year there seemed to be more giveaways and free schwag but beggars can’t be choosers, I suppose. I did talk to some other ladies in the area who stopped at other pitstops and got cool things like chamois towels and even a handlebar bag! I did get my free t-shirt and had the breakfast I wasn’t able to have before leaving this morning. I had gotten out a bit later than I had wanted to. I also got my hot-off-the-press Fairfax County Bicycle Map. There’s a good article about it at the Washington Post. I took a look at the map earlier. It looks pretty cool. My husband and I are always wondering how to get around places by bike in the area. This should help! There was a pretty decent turn-out at the pitstop despite the weather. Most memorable to me was the man who was tandem riding his daughter who was probably about 6 or 7 at the most. She was wearing her backpack underneath an oversized rain poncho and was too cute. What a trooper to participate even in the rain! As to the fender issue, It probably would have been nice to have one up front this morning. Definitely a lot of spray but not too bad. I may consider the EZ Fenders that are fairly quick to detach for days like this. Since my commuter is my regular bike because of the length of my commute, something I can take on and off easily sounds best. I’m working on that ride report for the Knotts Island Century, I promise! Tomorrow is our area’s Bike to Work Day. I have been watching the weather forecast diligently hoping that the Friday morning weather would be somewhat pleasant for riding in. Thankfully, the forecast is no longer really calling for thunderstorms. Rain, I can handle, lightning is a whole other matter. But the forecast is calling for certain rain for those of us planning on joining our area’s BTWD festivities. So I have been asking myself how I want to handle the rain. I don’t mind riding in rain, sometimes it’s even fun, but I definitely don’t like the wetness feeling that comes from the affectionately-called ‘skunk stripe’ that those of us who ride in rain without fenders get. I like fenders when it rains but I can definitely do without them when the weather is beautiful is out. I commute on my regular bike since it’s 15 miles roughly so whatever I put on there will generally stay on there. I had fenders on my hybrid before they practically fell off and like I said they were great in the rain. 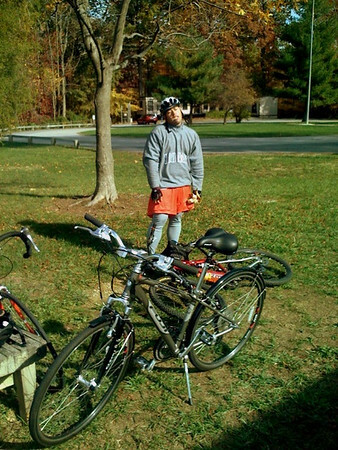 Ride your bikes from inn to inn along back roads and hills of the Shenandoah Valley between Staunton and Lexington. We’ll start you off with a full breakfast each morning, supply you with maps of the area, and transport luggage to the next inn – you’re free to explore the country and towns along the way. Four night package for two: $660 plus tax. Other lengths of time available. Call for more information. The husband and I have been trying to figure out what rides to do this year. We’re both fitter than we were this time last year. Among some of the rides we found was the Knotts Island Century thrown by the Tidewater Bicycle Association. We are opting for the metric century which is the furthest we’ve ever ridden complete with a ferry ride in the middle. The area is pretty flat and just minutes from my parents’ home. I figured it would be a nice way to kill several birds with one stone: first organized ride of the year, first metric century (flat), excuse to see my family especially my niece and my dog (who is on “vacation” with my parents), and spend Mother’s Day with my mom. I’m also bringing down some stuff that I want to give away to my sister and my friend so they will stop taking up room in my home. I figure it’s fairly win-win as long as we complete the ride strong. I am a bit apprehensive because we’ve never done this ride nor this distance before. We did a 32-mile ride on Saturday to help us get some miles in mostly along the Arlington loop (which was quite crowded) with some adjustments of our own. By the time we got to DC we were feeling good at about the 20-mile mark. From there we went to Georgetown and popped out in Rosslyn and proceeded up Wilson Blvd in all its hilly glory. Not only was it uphill but it was hot, baking from the pavement hot, and there was no shade. I quickly got crabby and prayed for any wind at all to help relieve me. From Arlington on, I was uncomfortable. I didn’t wear gloves because I couldn’t find the weightlifting gloves I had been using last year and did I mention I was hot? I felt like my skin was baking and thankfully I had put sunscreen on. There was this miserable whine coming from the front wheel that didn’t let up until I started going about 9 miles an hour. Then my left knee started bothering me. That hot hill up Wilson was what did me in. I’m hoping for more comfortable weather this Saturday for the century. Generally, I felt good after the ride. My shoulders and neck were kinda sore but that didn’t linger into the next day and I’m amazed at how my body doesn’t seem to feel anything painful the next morning after longer (to me) rides. My knees still hate me but I’m hoping they will forgive me once I get my Speedplay Frog pedals in that I ordered yesterday. I have heard they are great for people with knee issues like me who are knock-kneed so I figured that I’d use my $100 award from work and go ahead and buy the suckers. Among my other recent bike-related purchases were some yellow and black gloves to match my bike to be worn on the ride this weekend, Spinervals Sweating Buckets 2.0 Fitness Series for when it’s pouring outside, and a new pair of shorts that I got in a size Medium instead of a size Large (w00t!). I also bought my husband his first pair of shorts with padding and he said they were very comfy. I guess the secret to him is just to buy it and let him try them. I also signed us up for Bike New York’s Long Island Harbor Ride in June. We have yet to sign up for the Harlem Valley Rail Ride that we did last year and are tossing around the idea of doing the American Lung Association of America in Massachusetts Autumn Escape Bike Trek instead of the 8 Lighthouse Ride we did in Portland, ME. I am really excited about the Bike Trek which is a 3-day tour basically of the cape. I think it’ll be a nice intro into bike-touring with a support system. So that’s what we have on the plate so far. I’ll keep you posted. 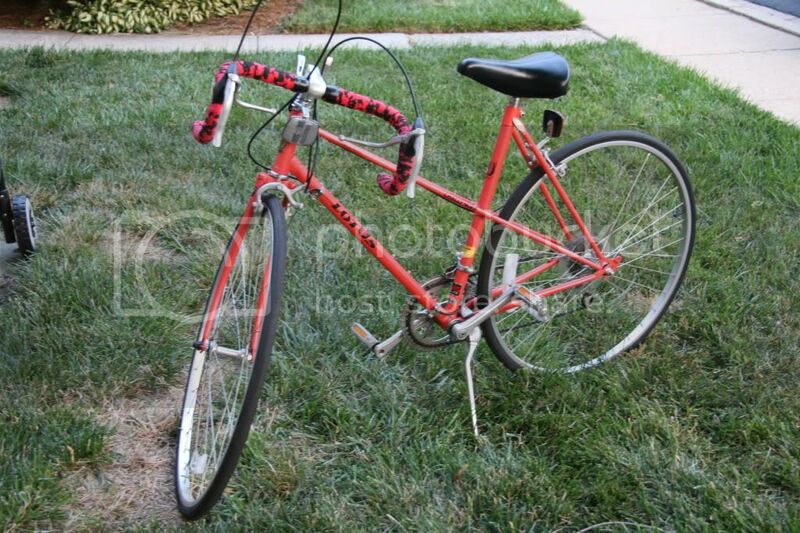 Our other friend, Hannah, told me earlier in the week that she was interested in perhaps getting a new bike. She is my height and she told me that what her budget was and I told her what she would be up against with such a limited budget and I told her that she and I should keep an eye on Craigslist. We passed a few e-mails back and forth over the week and last night I saw something that would be perfect for her: a 20″ Giant hybrid in her price range. She went to go see it and ride it and is now the proud owner. She reported to me that her first ride was 2 miles and that she learned she needed to switch gears on hills. When Hannah told me and our friend, Deb, that she now had a bike to ride, Debbie responded that maybe she would hang on to her hybrid rather than selling it as it has been forsaken in a storage unit somewhere. My other friend, Lindsay, whose coworkers have gotten into riding also has a forlorn bike somewhere waiting to be ridden. So I am determined to get these girls out riding with me one day. I am setting the weekend 2 weeks from this past one and Hannah says she’s all for it. Lindsay is booked till mid-June and no word from Debbie yet. But Hannah has a bike and is out riding it and that’s progress. I’ll keep you posted.